There is much to Bihar that makes it one of India's culturally most significant states. 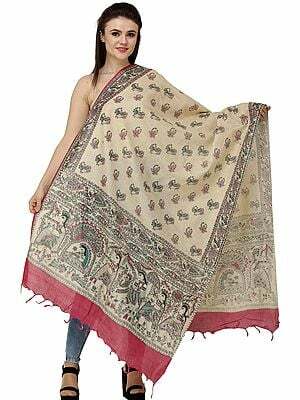 It is the home of superfine Indian silk weaving as well as the most exquisite of tribal folk arts, the Madhubani painting. The beauty of both have been captured in the gorgeous saree you see here. Dyed a blue so deep and gray it reminds one of dangerously deepening oceans. Zoom in on the solid-coloured field to appreciate the precision of such skilfull weaving, something that has been perfected by the region's venerated weaver families across generations. Team this with some statement silver pieces and probably a few jewels that match the colours of the madhubani border. It is indeed the pale ivory creme and pastels of the dense madhubani border that bring out the blue of this saree. Having traditionally been done on mud walls and primitive canvases, the sharp geometric curves and the natural colour palette of this style of painting have been reproduced here on the delicate silk fabric. The border consists of one long sprig of foliage held in by panels of miniscule cursive and triangular motifs. The all-important endpiece, as well as the part of the border across the pleats leading up to the same, feature a rustic black-haired beauty dancing in the woods. 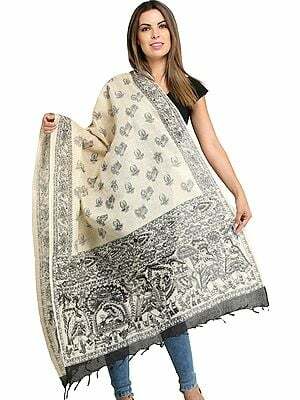 More elaborate motifs of the evergreen florals of Bihar could be found in the gracious falls of this saree.